Here are some brief thoughts on these tools and a good excuse to own both. Skew chisels are handy for getting into acute angles, such as the sockets of half-blind dovetails, as well as for easy access to square corners, such as cleaning out a hardware mortise. The skew chisels pictured above are available from Lee Valley, $27.50 for the pair, nothing fancy. They are about ½” wide and come with sturdy, though unattractive, hooped handles. For fun and aesthetics, I made Hondouras rosewood replacement handles intended for pushing, not striking. The edge forms a 65 degree angle with the length of the chisel on the acute side. An interesting tool sits between them, a Matsumura “bachi nomi” or fishtail chisel, available from The Japan Woodworker in various sizes, $39-$53. The 5/8″ edge forms an 86 degree angle with each side. This allows use in many tight spots but is not sufficiently acute to easily clean out lap dovetail sockets. The geometry of the bach nomi makes it more amenable to striking than that of the skew chisel. These two types of tool, one common, the other unusual, have some overlap in their function but I feel both are worth owning, especially since I am a big fan of Japanese chisels in general. How did you remove the original handles? The replacements you made look very hand-friendly. They look similar to the ones on the Veritas Detail Chisels. When you get new chisels, do you regrind the bevel or use the exising angle on the factory grind? I’m interested in how to set-up for grinding a precise skew angle. 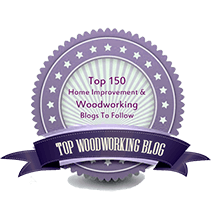 Most chisel handles will loosen if you hold the chisel by the blade with the handle pointed down, using a grippy glove or pad, and repeatedly whack the handle against a very heavy block of wood. These chisels came with a 20 degree bevel which I reground to 27 degrees using the Tormek grinder with the basic Straight Edge Jig (SVH-60) and added a 32 degree secondary honing bevel. Those angles are probably a bit steep for a paring chisel though. However, in general, I work with a new chisel’s original grind angle to start with and alter it as I gain experience with its edge properties. Another approach to dovetail corners is with the Japanese dovetail chisels by Masashige, from Hida Tool Co. (hidatool.com). 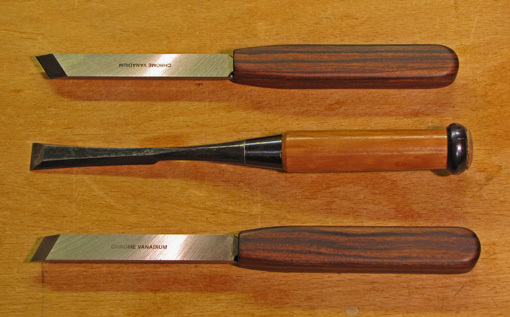 These are basically straight-sided bevel-edge chisels, but with the bevels ground so that they meet the flat (actually hollowed, in the Japanese style) surface of the chisel, without the customary small vertical surface at each side as on other bevel-edge chisels. Thus they don’t have to be pushed at an angle, just straight through, perpendicular to the surface of the wood. The angle of the sides is low enough to clear any of the customary dovetail cuts. Although I haven’t yet used any of their dovetail chisels, the standard Masashige bench chisels are easy to sharpen, and hold an edge very well, so I would expect the same of the dovetail ones. I was not suggesting either chisel for use with through dovetails or with the tails of any type of dovetail. The skew chisels are useful for cleaning out the sockets (pin section of the joint) of half-lap dovetails. I think the arinomi is an under-appreciated style of chisel. And since you’re using them just to chop/clean between tails, you really only need a few narrow sizes. Some woodworkers grind the sides of regular chisels to acheive the same effect.